Thanks to Zeb Andrews for posting this superb shot of the Peter Iredale, a shipwreck off of the Oregon Coast that has been buried in the sand for 102 years. Peter Iredale owned his namesake 2000 ton iron framed sailing vessel, part of a shipping fleet based in Liverpool, England. The ship sailed from Mexico, in September of 1906 headed for Portland, Oregon. Aboard was 1,000 tons of ballast and a crew of 27,which is reported to include two stowaways. In late October the Captain, named H. Lawrence, noted the Tillamook Rock Lighthouse. As the ship entered the mouth of the Columbia River it became grounded at Clatsop Spit, and after that the ship was driven ashore. Nobody was injured but efforts to recover the ship failed as it sunk into the sands off the Oregon shore. 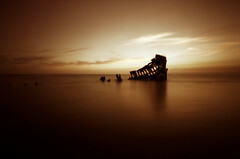 Why do we love pictures of shipwrecks? Is it a form of rubber necking? Ships, even those flying the American flag, were places of incredible danger, brutality and slavery. The lot of a seaman was not a happy one, even in American coastal waters. Once a seaman signed articles he could be worked watch-on-watch despite the dangers fatigue presented. Whippings on sailing vessels were common and one-captain even ordered two sailors who had just received a dozen lashes each to get fully and properly dressed and to row him ashore in the long boat. One can imagine what a shirt felt like on the raw flesh as well as what putting their backs into the rowing felt like! A Southern plantation owner travelling on a trip to Boston commented that he saw more sailors lashed in that one trip than slaves would have been lashed in six months on his plantation. I doubt the Oregon coast was spared the attentions of those who displayed false lights in order to lure ships to their doom for their cargoes. I think part of the fascination with shipwrecks is due to a realization of the conditions that were endured aboard ship. It is very apropos given the condition of our country. Yep, your captain did steer it into the shoals. (7) LOL…I didn’t vote for Bush but to clarify the positions on our great ship wreck. Fools Gold thanks for checking in with that … ummm… happy note on the adventures of our shipping past. Well, … perhaps not entirely a happy note but I think part of the charm shipwreck sites offer is the contrast between the beauty of nature and the acts of man involved in the improper construction or handling of ships. Many ships, many successful voyages … great beauty and great adventure. The shipwrecks are a reminder of the ever-present risks that they who go down in ships to do business in the sea take great risks that although often forgotten are in fact ever present. Scroll down and you will see some amazing photographs of battle damage. My father was at his battle station, an overflow sickbay just forward of the main mast, when a Japanese Long Lance torpedo penetrated the hull and exploded a magazine. It blew about 140 feet of the bow, everything forward of the 2nd turret, away entirely. Just under 200 sailors lost their lives. The bow rests in Iron Bottom Sound. Dad was in the first compartment that was not compromised by the damage. We stall have most of his WW2 letters. After Tassafaronga he wrote home that he knew every single one of those boys by their first names. The wrecks on Iron Bottom Sound are one of the world’s most favorite scuba attractions. And it is amazing that is country allows even people like him to live in it. Battle damage can indeed be severe and often the personal consequences can be severe. One submariner was scheduled to be the Best Man at his shipmate’s wedding but had to close the hatch on him and dog it down so as to save the ship. Some of the greatest heroism never even gets considered for a medal. Reading the Congressional Record’s transcripts of the Titanic inquiry shows some rather absurd notions and also some rather skillful approaches to problems. Those who do business in unquiet waters often experience great beauty as well as great ordeals. FG that’s an amazing tragic story – have you got a reference for that? On the New Orleans my father traded a big container of a type of alcohol the surgeons refused to use to the sailor who ran the ship’s store. He “distilled” the alcohol into whiskey, which he sold for a big profit. The medical department got free ice cream. A group of sailors had to come through their area and drop through a hole to their duty station (an older ship retrofitted with modern gear), which was a communications center. They would look with envy at all the ice cream, so the Docs gave in and started sharing it with them. They all became good friends. When the torpedo hit those sailors were trapped below at their duty station. Eventually the damage-control party got them out. They appeared uninjured. As the hours passed they developed breathing difficulties and started dying – one by one. The fumes they had inhaled had burned their lungs. All the Docs could do was watch them die. Some of the sailors in the damage-control party also succumbed the same way. JCH another tragic but amazing story. My wife’s dad was also in the So. Pacific, stationed on an island that would sometimes come under attack from the air. He’s almost 90 but those memories are his most vivid.